The North American Raccoon (Procyon Lotor) is probably one of the most widely recognizable animals with a range that includes much of North America and down as far as Central America. As a result of deliberate introductions, the raccoon is now also found across mainland Europe, Caucasia and Japan. 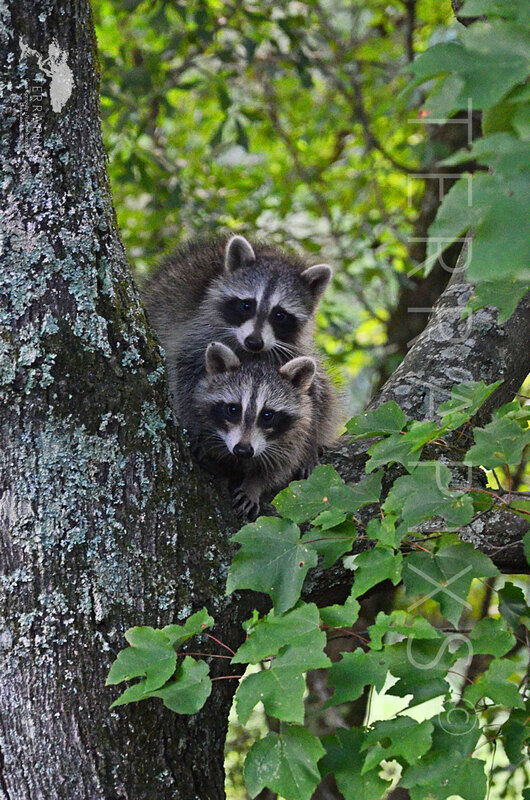 Once inhabitating primarily mixed deciduous forest, these masked bandits have invaded all manner of habitats including mountainous areas, coastal marshes and urban areas where many homeowners consider them pests. They are very intelligent and, with highly dexterous front paws, can open most any food containers, especially dog and cat food stashes. After a gestation period of 65 or so days, two to five young, called “Kits”, are born in spring. The mother raises the Kits, teaching them to hunt their usual food (various invertebrates, vertebrates such as frogs, mice, etc, and some plant fruits). These guys are mostly live in and around trees and are nocturnal but can be seen in urban areas during the daytime, especially when food is to be had. By fall the Kits disperse and are on their own. In the wild they can expect to live only 2-4 years. The two Kits in the picture live in north central Alabama, Blount County to be exact, on our beautiful farm. I had been watching the family all summer in our woods along the creek when I noticed the mother missing. She had been hit by a car crossing the highway at night. Fortunately, the two Kits survived and late one day in August showed up on our deck with hungry looks in their eyes. They now show up about 6:30 PM every day for their handout, little balls of fur skittering about your feet and chattering while I dish out their food. Not to worry. They will mature and stop coming around later this fall. Their survival instincts coupled with what their mother taught them will allow them to survive in the “wild” quite well. For now though, we enjoy seeing them. Have a wonderful October and by all means do visit to nearest woodland and soak up a little of what nature has to offer.